Some argue that regional categorization of whisky is, at best, misleading. Me, I tend to find that it can be useful in grouping whiskies that have somewhat similar flavor profiles (for example, if someone doesn't like peat, don't recommend an Islay to them), although it doesn't always work out that way. However you feel about them, though, "Island" is a just plain silly way to label a whisky. There are about a half-dozen different islands that produce whisky in Scotland, each with its own distillery. It just seems horribly imprecise to me; however, I've not tasted many of these, so it remains to be seen if I can detect any similarity in their flavors. 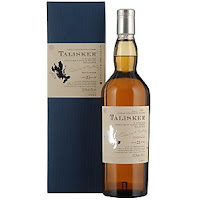 Today, we've got the base Scotch offered by the Isle of Skye's distillery, Talisker. There's lots of sherry on the nose here (glancing around online, I appear to be the only one to think so, but I'm not taking it back! ), apples and bananas. Very pleasant and malty. Peat, too, and it blends very nicely with the sherry in a way I don't think I've encountered before. It's very sharp on the tongue, thanks to its relatively high alcohol content, but it's not unpleasantly so. The finish is all wood smoke, with a bit of clove and maybe a hint of chocolate hiding underneath? It's really quite nice, I must say! A really good mix of sweet, peat, and smoke, if you happen to like those things, which I rather do. :) It's a little on the pricey side, but not too bad...I could easily see myself buying another bottle sometime.